Emergency responders transported a half-dozen Lompoc area high school students to the hospital Monday after finding three of them unresponsive and determining all six were under the influence of Xanax. The incident concluded with deputies arresting one of the students, who was already on probation. Deputies found the student to be in possession of more than 70 Xanax pills. Shortly after classes began at Cabrillo High School, a teacher observed a student who appeared to be under the influence of a controlled substance and reported it to the school office, which relayed the message to the new sheriff’s deputy on campus. Shortly later, a student from the Community Day School walked into the office at nearby Maple High School and, too, appeared to be under the influence of a controlled substance, according to the Santa Barbara County Sheriff’s Office. Deputies then located a vehicle in the parking lot with three female Maple High School students inside who were found to be unresponsive. Investigators found a fourth impaired female outside of the vehicle. Santa Barbara County Fire and American Medical Response paramedics arrived at the scene and provided medical assistance to each of the students. Responders determined all six individuals were under the influence of Xanax and transported them to the hospital for a medical evaluation. After receiving medical clearance, the student from the Community Day School was arrested for possession and distribution of Xanax. He was also charged with violating his probation. Sheriff’s officials are thanking the Lompoc Unified School District for promptly reporting the incident to law enforcement. The sheriff’s office is also reminding community members to properly dispose of unwanted or unneeded medical prescriptions, like Xanax. 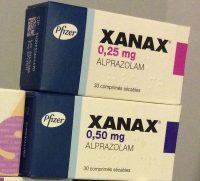 Authorities say Xanax is extremely dangerous, even fatal, if abused. Parents and teachers who notice a student who appears to be sluggish to the point of possibly being under the influence of Xanax or another controlled substance should report the incident right away, sheriff’s officials said. o.k. folks, here’s how it works. You have regular high school, after you’re thrown out it’s on to continuation school, which they just used to call “Continuation School” until it was politically incorrect. SLO’s “Pacific Beach High School” was a modular building well fenced from Emerson Elementary’s field at the corner of Pacific and Beach streets. After you get thrown out continuation school it is on “Community School”, such a nice wholesome name. Here the “teacher” is a de facto probation officer but without the primo, but still nice, pay and benefits. No teaching occurs, the cops just know they’re off the street from 8-3 weekdays. I got the straight up/down low from a “community school” “teacher”.